glows in the dark, light-blue, greenish-white, not magnetic! 1 pc. 12,95 EUR ea. Silly Putty "Glow" impresses with cool tricks and fascinating effects. You can shape it, knead it, pull it, rip it, or let it bounce. Additional feature: It glows in the dark! Available in 3 different variations: "Krypton" (radioactive green), "Northern Light" (milky blue) and the fascinating "Glacial Ice", which also changes colour. The magic putty is delivered in a practical metal container. 1 pc. 3,95 EUR ea. 1 pc. 13,95 EUR ea. changes colour during kneading, different colours, not magnetic! Make pasta, loops, let it bounce or rip it apart: This putty is up for anything and glows on top of it! Depending on the type and strength of force applied, the putty displays very different features and behaviours. 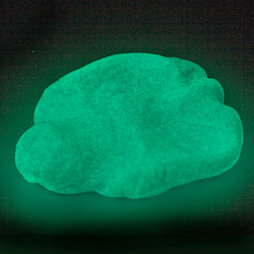 The type "Glacial Ice" combines two of the most popular additional features of the Silly Putty: It glows in the dark and changes its colour while you knead it! When you open the can, "Glacial Ice" is light blue; warmth makes it change to greenish-white. In the dark, on the other hand, it glows blueish. Hence, you get two special effects in one putty - you gotta have one! When it's light, the putty looks just plain white and a little shiny. But when you turn off the lights, it unfolds its illuminating power. To "charge" hold the putty under a lamp for a minute - and then be amazed in the dark.